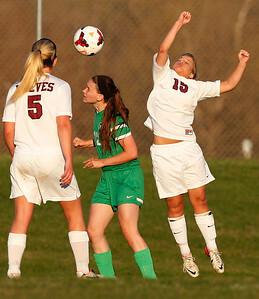 Matthew Apgar - mapgar@shawmedia.com Prairie Ridge's Gabrielle Fanning connects with a header during their girls soccer game against York on Thursday, April 16, 2015 at Prairie Ridge High School in Crystal Lake. York won 2-1 on a goal made with less than three minutes left in the game. 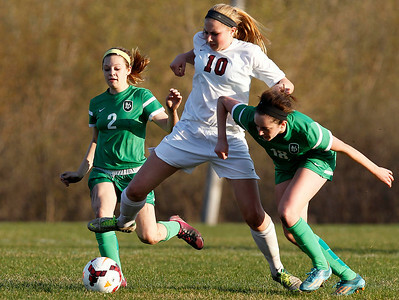 Matthew Apgar - mapgar@shawmedia.com Cassie Warton of Prairie Ridge, left, tries to maneuver the ball around York's Kaylin Kenny, right, during their girls soccer game on Thursday, April 16, 2015 at Prairie Ridge High School in Crystal Lake. York won 2-1 on a goal made with less than three minutes left in the game. 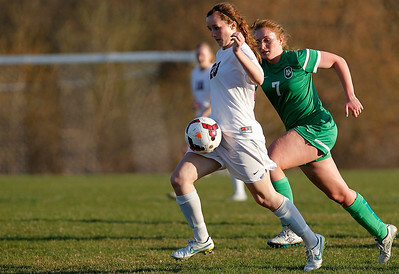 Matthew Apgar - mapgar@shawmedia.com Prairie Ridge's Hanna Stovall, front, traps the ball and brings it downfield ahead of York's Juliana Salzano during their girls soccer game on Thursday, April 16, 2015 at Prairie Ridge High School in Crystal Lake. York won 2-1 on a goal made with less than three minutes left in the game. 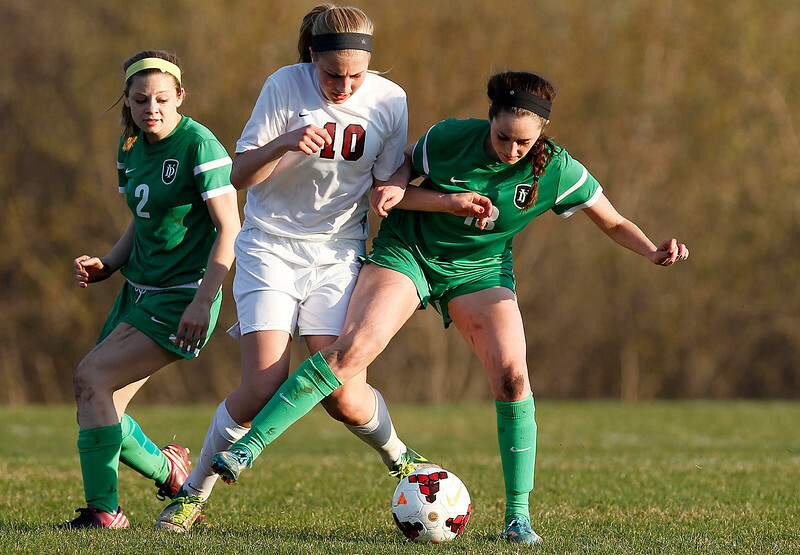 Matthew Apgar - mapgar@shawmedia.com Prairie Ridge's Josie Ericksen, center, tries to fend off York's Jenna Lundgren, left, and Madison Navarro, right, during their girls soccer game on Thursday, April 16, 2015 at Prairie Ridge High School in Crystal Lake. 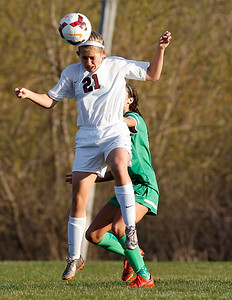 York won 2-1 on a goal made with less than three minutes left in the game. 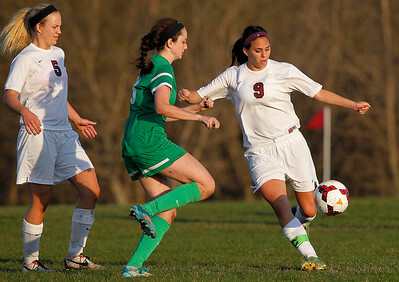 Matthew Apgar - mapgar@shawmedia.com Prairie Ridge's Shannon Patinella, right, takes control of the ball ahead of York's Madison Navarro, center, during their girls soccer game on Thursday, April 16, 2015 at Prairie Ridge High School in Crystal Lake. York won 2-1 on a goal made with less than three minutes left in the game. 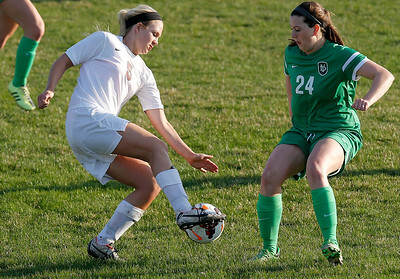 Matthew Apgar - mapgar@shawmedia.com Prairie Ridge's Mariah Truitt, right, jumps up for the header with York's Madison Casey, center, during their girls soccer game on Thursday, April 16, 2015 at Prairie Ridge High School in Crystal Lake. York won 2-1 on a goal made with less than three minutes left in the game. 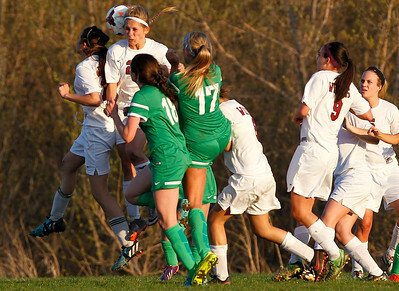 Matthew Apgar - mapgar@shawmedia.com Prairie Ridge's Kristen Vosberg, left, and Gabrielle Fanning, second from left, jump up for the header on a corner kick that would be kicked into the net by York's Madison Casey as the game winning goal on Thursday, April 16, 2015 at Prairie Ridge High School in Crystal Lake. York won 2-1 on the Casey goal with 2:17 left in the game. Prairie Ridge's Josie Ericksen, center, tries to fend off York's Jenna Lundgren, left, and Madison Navarro, right, during their girls soccer game on Thursday, April 16, 2015 at Prairie Ridge High School in Crystal Lake. York won 2-1 on a goal made with less than three minutes left in the game.